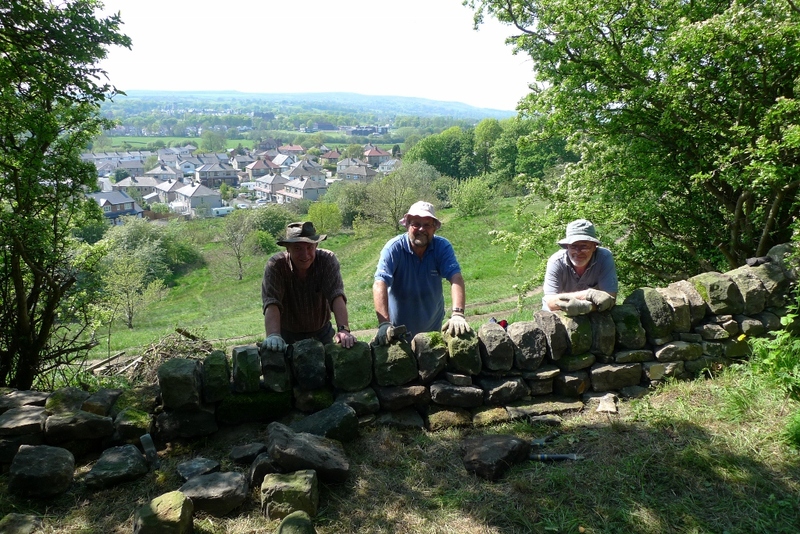 On the first warm day for months, Colin Alexander, Crawford Smith and Martyn Smith, of the Otley & Yorkshire Dales branch of the Dry Stone Walling Association set out to complete a complex puzzle. How to rebuild the tumbled wall at the ‘sheepfold’ entrance? “There are many ways it can be done, it’s finding one that works”, said Martyn. The gentlemen were particularly hard pressed with this wall, as not all of the stone was still lying around. As this is a traditionally built wall, the batter, or slope of the wall, is a key feature. The A shape of the wall means the stones get smaller as they go up, and this shape is a crucial part of the structural strength – a vertical wall would topple over much more quickly, as the stones settle. The puzzle was solved by building the wall on a small platform, and then shaping the top in a U, “so that you’ve got a dress gallery to watch the sunsets”, quipped Crawford, “you’ll be able to set up the stalls the other side”. One of the hard tasks, was chipping away all the concrete that had been used to cement the cope stones (shaped top stones) together – not standard practice by a skilled craftsman, who pride themselves on their engineering prowess ! Unfortunately, no treasure was found in the wall, like the bag of George III pennies found in a wall on the Chevin. But, Martyn did comment that the cope stones were unusual for a mere field wall, as they were nicely shaped. Which all adds to the mystery of what the wall was for – obviously not just a retaining wall. 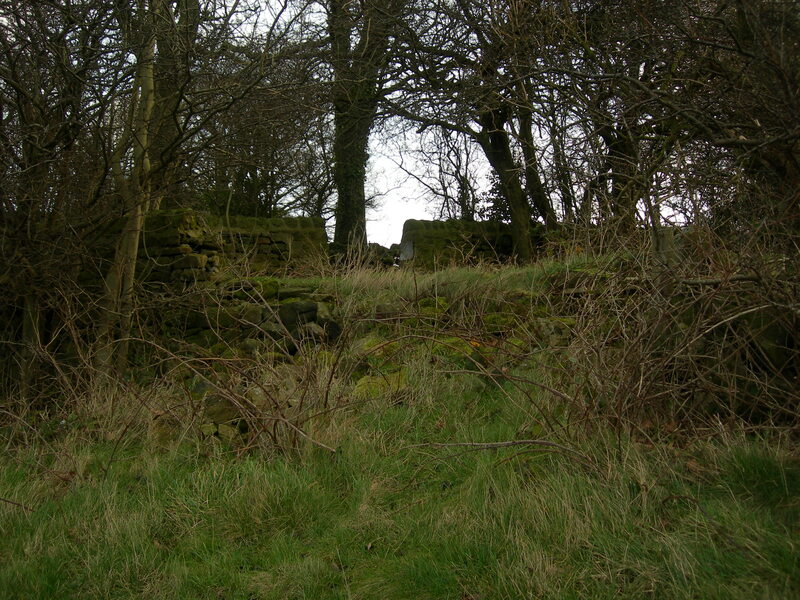 However, it is very unlikely, due to the wall height that it was a sheepfold. So, we will need a new name for the entrance, which hopefully the Scouts are going to provide for us. 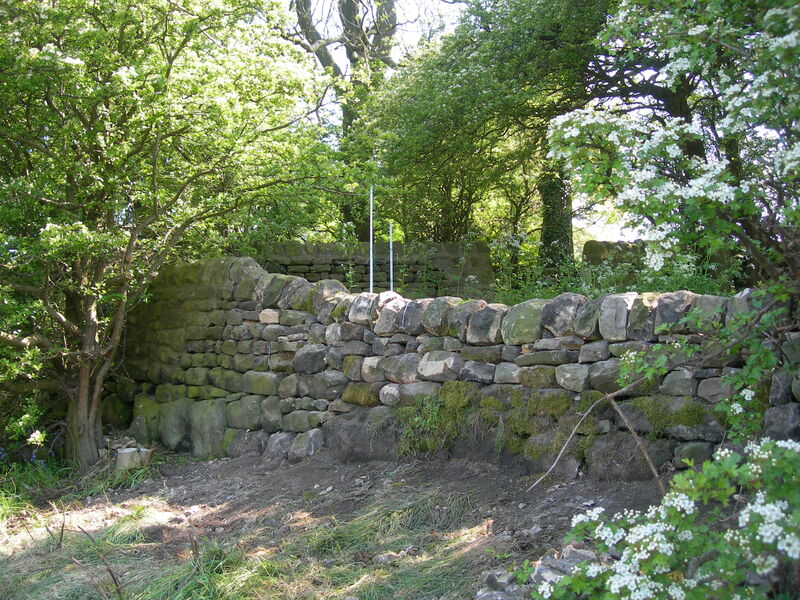 If anyone is interested in learning more about the craft of dry stone walling, then the Otley Branch have their HQ on the Chevin, near the Surprize View Car Park, and they run regular courses. They will also do ‘team building’ days for companies who want to get together and do something other than email and attend meetings !! Details on their website. This entry was posted in Facilities, Friends, Regeneration, Uncategorized. Bookmark the permalink.